Heat cooking oil in a large wok. Divide pancit canton into tow portions. Deep fry in hot oil one portion at a time, until golden brown. Drain on paper towels. Set aside. Remove oil from wok, leaving only about 2 tablespoons. Stir fry garlic and chicken strips in oil over high heat until chicken is lightly browned, about 3 minutes. Add shirmp, mushrooms, snow peas, carrot, bell pepper, and onion leeks. Pour in stock and stir the mixture. In a small bowl, combine five spice powder, oyster sauce and sesame oil. Stir into vegetables and let simmer for a few minutes. Remove from heat. 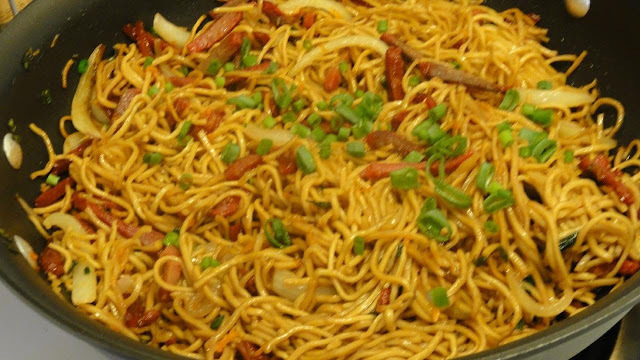 To serve, place fried noodles on serving plates. Spoon meat vegetalbe sauce ove the noodles. Serve immediately. Note: you can also soften the pancit canton before frying to separate the noodle strands. Divide the pancit canton, into two portions. Soak each portion in a bowl of water just until softened. Drain for several minutes to remove excess water. Deep fry noodles in hot oil until crisp. It will take a few minutes longer for the wet noodles to turn crisp. End.